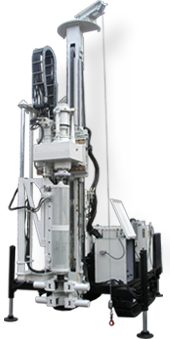 Drilling equipment and machinery for water well, mining, geotechnics and geothermal rigs. With over 30 years experience and 250 equipments in the market consolidates Talleres SEGOVIA internationally as a leader in the design and manufacture of equipment and drilling consumables. SEGOQUI THD-20 equipment doing wick drains work for soil improvement and treatment in the province of Tel-Aviv, Israel. channeling and UNDERGROUND SUPPLIES. Horizontal drilling equipment SEGOQUI PH-220 drilling a diameter of 1.200mm through Highway M-40 without traffic disruption. During the past 10 years, Talleres SEGOVIA has undergone a process of internationalization based on the supply, training and commissioning of equipment and projects in different countries. SEGOQUI 1920W equipment drilling a hole around 800 meters depth for mining exploration in the Chilean mountains at 5,500 meters above sea level. With 35 years of experience and more than 150 equipments in the market and a strong international presence, TALLERES SEGOVIA, SL is a leading company in the design and manufacture of drilling equipment and accessories for the mining, water supply and public works and has a wide range of products and parts to meet market any technical need. Welcome to our web site and thank you in advance for your interest. Talleres Segovia / Segoqui is a Spanish group based in Fuenlabrada (Madrid). It has pursued since its founding in 1972 to be the leader in the manufacture of drilling equipment for water well, mining research and geotechnical studies. This is a company with a design department and own infrastructure necessary to manufacture equipment and accessories and cover any need for mining, water well and public works.